A delegation of the League of African Development Students (LEADS), presently on Advocacy Tour of Southern Africa has paid a Courtesy Visit to the Management of a foremost investments firm in Namibia - Profile Investments Holdings (Pty) Limited today. This was made known to Nedu Echianu's Blog in a telephone interview with the Secretary -General of the organization - Osisiogu Osike this evening, from Windhoek - Republic of Namibia. The visit was part of the Advocacy Visit to ascertain the positive contributions of the firm towards Africa's quest for sustainable development and self reliance, intimate the firm about activities of LEADS and present prestigious duals awards. 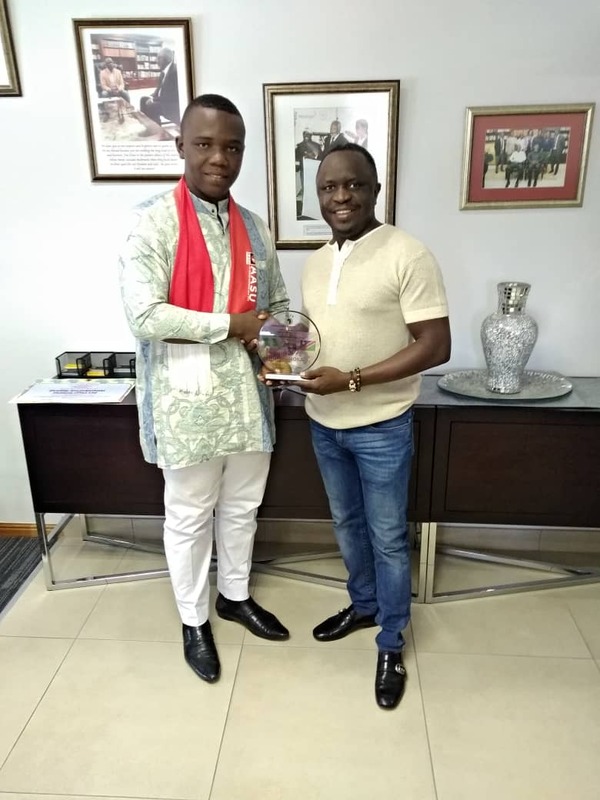 Highpoint of the event was the conferment of the prestigious Africa's Patriotic Personality Awards on the Executive Chairman of Profile Investments Holding - Mr Vaino Nghipondoka for his leadership, commendable patriotism, support to youths and students, and meritorious service to God, humanity and the African continent. Other members of the Profile Investments Holdings Pty Limited who were part of the meeting includes the Managing Director - Mr. Solomon Nemaire, and the Marketing Liaison Officer - Chareen Kauazunda. While LEADS delegation led by Osisiogu Osike - Secretary-General, Musa Abdulrauf Adavize - Director Programmes, both from West Africa, and the Regional Secretary of the Namibian National Students Organization (NANSO) - Epaphras Sheya Ngolo. In his remarks, Mr Vaino Nghipondoka thanked LEADS for the noble initiative, and urged the Namibian Students to consider bestowing similar awards to distinguished Achievers around the continent. He also acknowledged the important role his team of Management and Staff have always played in his achievements, and appreciated them, while promising find ways of mutual engagements and support for LEADS.